Welcome to the page of the East Orange School District Early Childhood Department. We work very hard to provide our preschool children with the essential opportunities to learn and practice the social-emotional, problem-solving, and academic skills that they will use throughout their lives. The East Orange School District provides a full-day preschool program for our youngest residents who turn three or four by October 1. We have preschool classrooms in ten of our district schools, and we collaborate with eight licensed community providers and Head Start. There is no fee for the six-hour school day. Many of our community providers have before and after-care available. However, we base the fee for this additional program based on income eligibility. Our mission is to join with all district and affiliated preschool classrooms to provide children with access to safe and accessible, high-quality early education that includes a developmentally appropriate curriculum, knowledgeable and highly skilled educators, and comprehensive services that support their health, nutrition, and social well-being in an environment that respects and supports diversity. 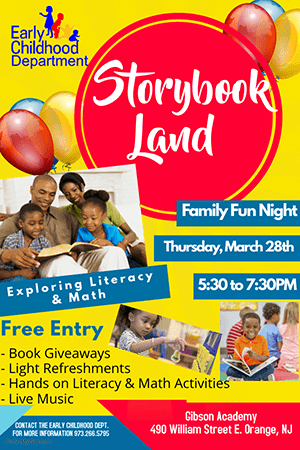 We seek to improve professional practice and working conditions in the East Orange Early Childhood classrooms by providing professional development opportunities and resources for those who work for and with young children. We support early childhood teachers and classrooms by using reflective practice to improve instruction and develop an effective curriculum. Within our department, we will work to build a high-performing, inclusive organization of groups, and individuals who are committed to promoting excellence in early childhood education for all young children. 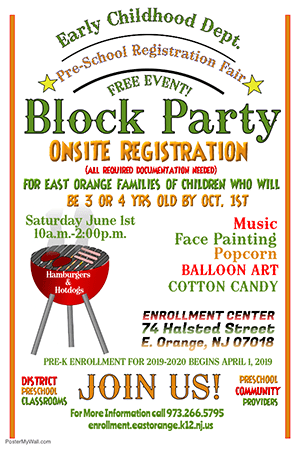 The East Orange School District Early Childhood Department aspires to be pioneers in collaboration with families and communities that focus on developmentally appropriate practices where young children, play, learn, and grow with the foundations needed to be educational models of excellence for the State of New Jersey. We use, in our high-quality early childhood classrooms, the Tools of the Mind curriculum. Tools of the Mind is a research-based early childhood program that builds strong foundations for school success by promoting intentional and self-regulated learning in preschool. Tools instructional philosophy is inspired by the work of Russian psychologist, Lev Vygotsky and his students, and at the same time is rooted in cutting edge neuropsychological research on the development of self-regulation/executive functions in children. Please read more information about the Tools of the Mind curriculum.The Tools of the Mind Curriculum is also in line with the New Jersey Department Preschool Teaching and Learning Standards. For more information, please feel free to visit their website. 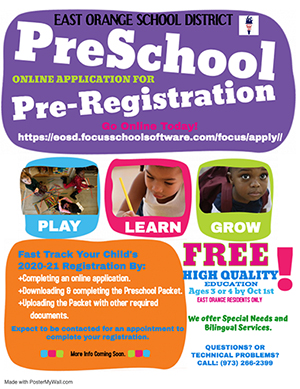 Additional information pertaining to preschool registration is located on our Enrollment Center website. The phone number at the Enrollment Center is (973) 266.2399. The State of New Jersey requires all pre-k students get lead tested. Please have your child tested prior to registering. Lead poisoning can cause learning and behavior problems in children. Lead can also cause slowed growth, anemia, and hearing problems. A child might have lead in his or her blood but still look healthy. Please do your part to prevent lead poisoning. Know your child’s lead number by talking with your physician or your local health department. For answers to questions, please call the East Orange Health Department - Lead Program at (973) 266.5489.